Middle East Forum Shillman/Ginsburg Fellow Aymenn Jawad al-Tamimi is one of world's leading researchers on the Islamic State (IS) group terrorizing Iraq and Syria. The overwhelming majority of his writings and translations are too detailed or esoteric for distribution to a general audience, so instead MEF compiles periodic updates providing links and summaries for those who wish to follow the groundbreaking work of this prolific young scholar. For more general interest writings by Jawad al-Tamimi, click here. Examination of the most prominent pro-Islamic State Twitter activist, known as "Shami Witness", who was recently unmasked as a business executive in India. A look at Iranian-backed Shia paramilitaries that have risen in the wake of the IS advance. A case study of Jamaat Ansar al-Islam's absorption into IS and why it sheds light on how to interpret pledges of allegiance to IS from both local (Iraqi and Syrian) and regional jihadist groups. 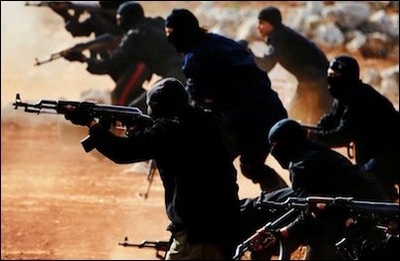 Examination of Jamaat Jund al-Qawqaz (The Caucasus Soldiers' Group), a largely Chechen Sunni group operating along the coast of northern Syria, leaning somewhat more toward Jabhat al-Nusra than IS. Examination of predominantly Kurdish groups defending the Syrian border town of Kobani from the IS advance. Excerpt of a March 2014 statement by the leader of a rival Iraqi Sunni jihadist group and explanation of why it sheds light on the timeline of IS leader Abu Bakr al-Baghdadi's rise. Statement from an ex-Baathist Sunni group that helped IS seize control of northern Iraq in the summer of 2014. Statement from another secular Iraqi Sunni group that has supported the IS advance. A new musical chant (nasheed) from IS's Ajnad Media Foundation, this one stolen without attribution. An IS musical chant (nasheed) notable for the phrase "We break the crosses," in reference to the group's atrocities against Christians. An IS musical chant (nasheed) notable, Jawad al-Tamimi writes, for its "benign tone, emphasiz[ing] the supposed peace, security and ideal nature of life under the group's rule." Notable in that the attack in the Iraqi Kurdish capital was carried out by a Kurdish member of IS. Notable as the group's first explicit recognition of pledges of allegiance to IS and Abu Bakr al-Baghdadi from outside Iraq and Syria.